Moving from one home to another can be both exciting and stressful at the same time – no matter how many times you’ve done it before. Yes, you can outsource the packing – and most people use moving companies to get their boxes from A to B – but the one thing you can’t run away from once you’ve started the process of moving is what to do once you’ve made that move… Where do you even start?! Well, since most move-ins happen at the end of the month, so what better time to get you equipped with tips on what you need to do in the first 24hrs of settling into your new home. Get arranging. You’ve seen your space before moving in and probably already imagined where your things will go and how it will look as finished product. Since you’ve already gotten the idea settled and your boxes are (hopefully) clearly labelled, you can already start putting boxes in the areas they need to be unpacked. This will make unpacking and setup easier over the course of the next few days (no shame in it being weeks). Make your bed… so you can lie in it! Make this one of the first things you do - this way if you need a little snooze in between the unpacking, you have a sleeping place waiting for you. Nothing like plonking yourself into a good night’s rest after long day of moving… even better if you’ve already prepared for it during the day. Get those essentials unpacked. Hopefully these will be in a clearly marked box from the packing phase already… if not, sjoe, happy digging! It may seem like an unimportant task to do before setting up the furniture, but you don’t want to find yourself digging for a toothbrush or facecloth late at night. It’s often best to get the daily necessities sorted ASAP to avoid having to dig through boxes as a matter of urgency. So get yourself into the mood of unpacking by starting with those kitchen and toiletry essentials, your bedding and towels, the right medication and everything else that you will need to keep you going as you settle in. Get your security sorted. Do your best to secure your valuables by setting up home security devices as soon as possible after moving in. Things like changing the locks of your exterior doors, installing security gates or cameras, or even putting up a “Beware of the dog” sign on the gate are a good move to ensure your home security. Lessen the “help-yourself-to-my-things” invitation by dressing all windows and covering any areas that are visible the outside world outside your property. You should also be wary of how you dispose of evidence of valuables – the boxes you throw away could be an indication of what thieves can find inside your home. Get connected. You’re probably wondering why this would be so high up on the list… well aside from making sure the necessary changes to your insurance have been done – yes, insuring online is no myth – you do need to get in touch with the world. As stressful as the first day of moving can be, at some point you will need the internet – be it to search nearest food joint, how to set something up to suite your new or home or simply put you to sleep after hours of unpacking. Pace yourself. You’ve made your bed, put your boxes where their contents need to be and you’ve setup your connections and security points… now the real work starts! As you start unpacking, you want to be realistic with yourself and not play superhero – take it one box at a time and one area at a time. Pace yourself by prioritising the areas to be set up in order of importance for use. Taking on too much at once will not only exhaust you, it will also confuse you. While you’re unpacking, this is an opportunity to document your home contents so that you can be sure that you are not underinsured – it sounds like an added task, but trust us, the peace of mind is worth it! 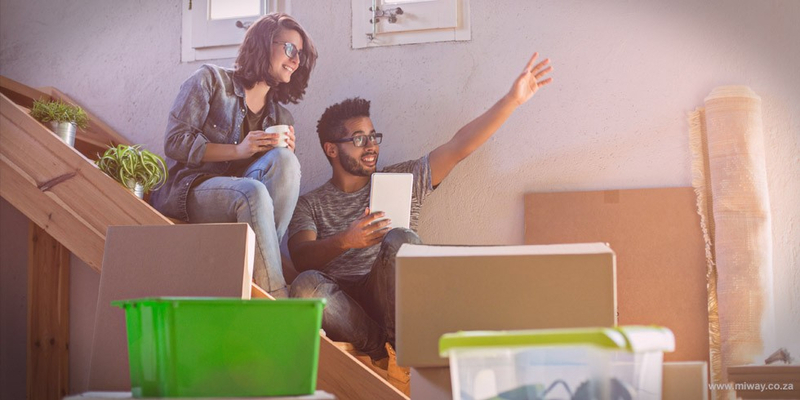 We understand that there is a lot to be done when moving in, but from these 6-step starters one can already see that it doesn’t have to be a daunting schlep… in fact, it’s almost as easy as insuring your home. Oh, and while you’re settling in, don’t forget to pop on over and meet the neighbours.